On Saturday September 15 a few of us did a 24 hour race in Ashford called the Churn and Burn. Riders from Nerac Earth included Mike Nugent, Kyle Stockford and Cliff Kenyon. Art Roti was also a member of our team. We entered the 4 person division. We arrived at the campground on Friday evening and were greeted with cloudy skies. Mike had gotten there earlier in the day and already had the Nerac tent set up in the campsite. Our campsite was huge which was a good thing given all the stuff and people we ended up filling it with. I arrived and went for a quick pre ride. I was surprised at how short the laps were but was happy with the level of technical terrain. After the pre ride Kyle arrived with Dana (our first fan / support person) and we got to setting up camp. We ended up with 2 tents, a pop up and 2 easy up tents. Friday night the rain started around 11 and did not stop until Saturday morning around 10 (the race started at 11). The first few laps were a little slippery but as we have been in a drought for most of the summer the course was surprisingly dry. Kyle started for us and was second after the run and second after the first section of trail. A good way to start the race. Kyle finished the first lap in around 8th place as he had to stop and clear mud from his eye. Next up was Art followed by Mike and finally me. Lap times on the first laps for our team were between 25-32 minutes. We quickly decided on a new strategy given the laps were so short. Our new strategy was to order the riders as follows: Kyle, Art, Kyle, Art, Mike, Cliff, Mike, Cliff (repeat from beginning) we maintained this setup until night when each rider went out for 2 laps in a row. The race went very good for us and we had only 2 significant issues during the race. 1st Kyle decided that doubling a root section was a good idea, it was not! 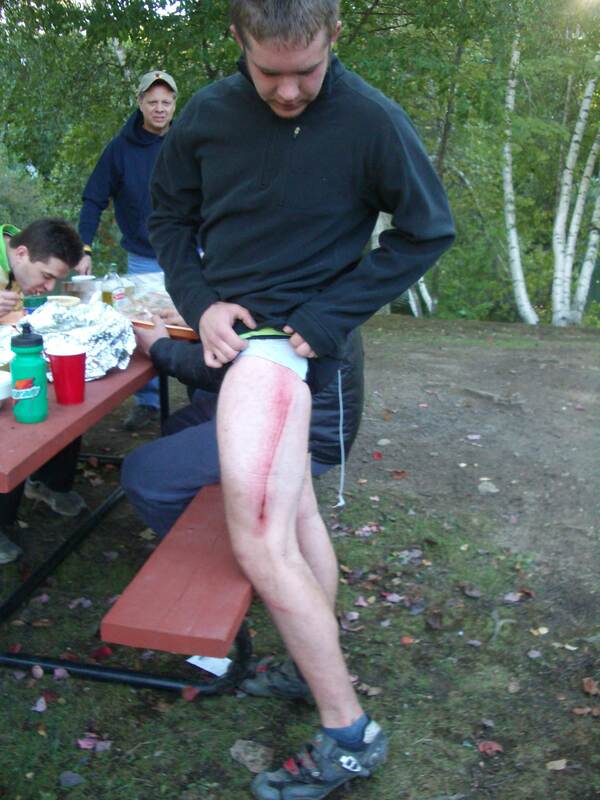 His front wheel came up short and he ended up with a nice cut (bruise) which ran from his hip to his knee. Next came Mike who apparently believes one cannot flat if you have filled your tubeless tire with Stan’s. He was wrong! After flatting his rear tire Mike got in some nice cross training, running with his bike for a mile or more. Our support personnel started to show up late afternoon / early evening. First was Robin Stockford who brought us some pasta and chicken. Next was John Stockford followed by Andy and Jill, who brought us a feast of pasta. Everyone was great, providing needed encouragement, helping with bike maintenance and most importantly keeping the fire going! Saturday night was cold, 40 degrees or under. The fire enabled us to have a warm place to hang out and dry wet clothes after each night ride. Many thanks to all that helped out during the weekend! We knew fairly early on our team was going to be competitive for the win. By 5 on Saturday night we had a 2 lap lead on the second place team and a 1 lap lead for the overall (competing against a 6 member team). We could not increase our advantage during the first part of the night and the gap stayed consistent at 2 laps and even decreased to a tie for the overall. The second part of the night we were able to get some more time and increase our division lead to 5 laps. The overall was still tight so we were going to have to keep riding well. Congrats to our 24 hour Churn and Burn champions. The Nerac Earth team consisting of Cliff Kenyon, Kyle Stockford, Michael Nugent, and Art Roti placed 1st in the 4 person bracket in addition to breaking the record for most laps ever at this venue. I grew up in Vernon and always have wanted to do the Vernon to Vernon ride. 2007 brought some changes: it wasn’t on my call weekend and the route was a loop from Vernon Cycle rather than from Vernon Vermont to Vernon CT. The weather wasn’t raining or blazing hot so I was game. I was even able to talk one of my physician colleagues into riding the 40-mile loop. V2V supports Cornerstone which is a great resource to some of the women we care for in our OB/GYN practice. I chose to ride the century loop figuring it couldn’t be any worse than the Steeple Chase. I think I may have been wrong (at least for the first 60 miles anyway). There was some serious sufferring going on. Geoff routed us through some steep grades north of 190. Not much draft advantage while riding due to the light attendance. Thanks to Geoff for an outstanding job marking the route. No need to even use my route sheet. (BTW the route is on mapmyride.com). The three rest stops boasted some great power foods. I loved the jelly beans! The scenary was absolutely beautiful and the roads with minimal car traffic. I hightly recommend this event and hope to see you all there in the future!